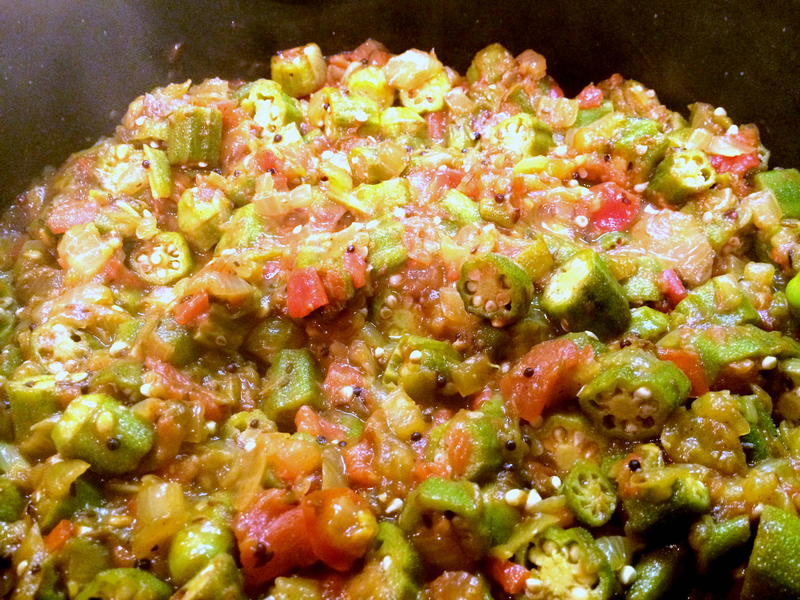 Okra cooked with onions, tomatoes, green chilis, and spices. 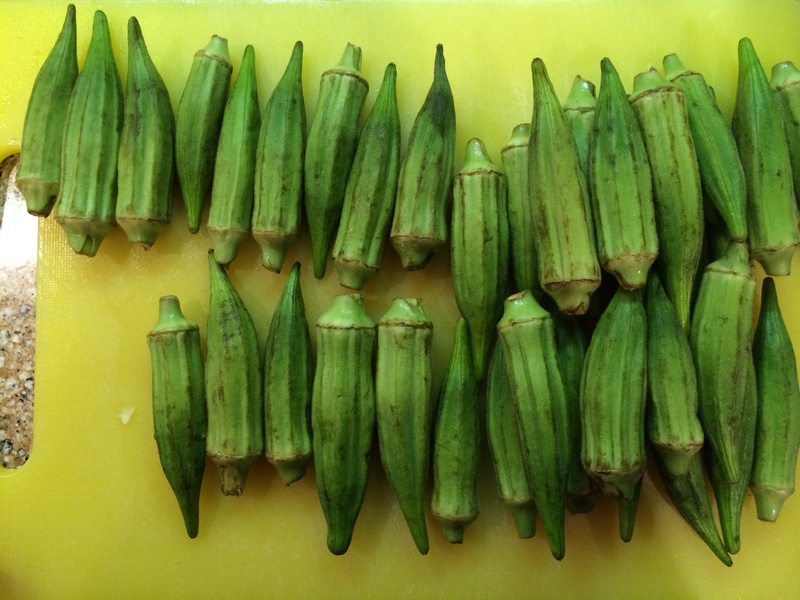 I love okra but I feel like I never hear about enough different preparations for it. It is delicious deep-fried, of course (what isn’t good deep-fried?) but it seems a shame to coat it in a layer of fried dough when the flavor and texture of the okra is what makes it so superb in the first place. 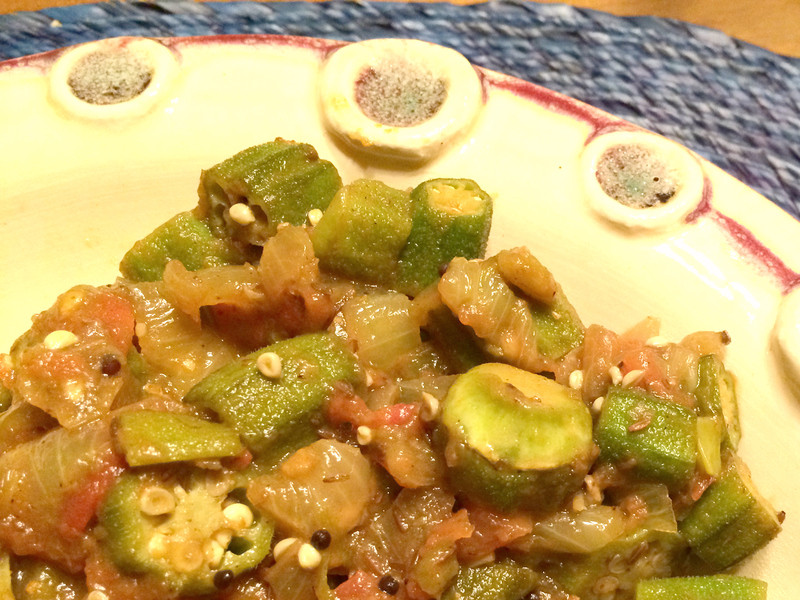 Bhindi Masala is one of my favorite ways to eat okra – and my whole family loves it too. The okra is so meaty (and so incredibly tasty) that serving this dish with rice is a satisfying meal on it’s own. 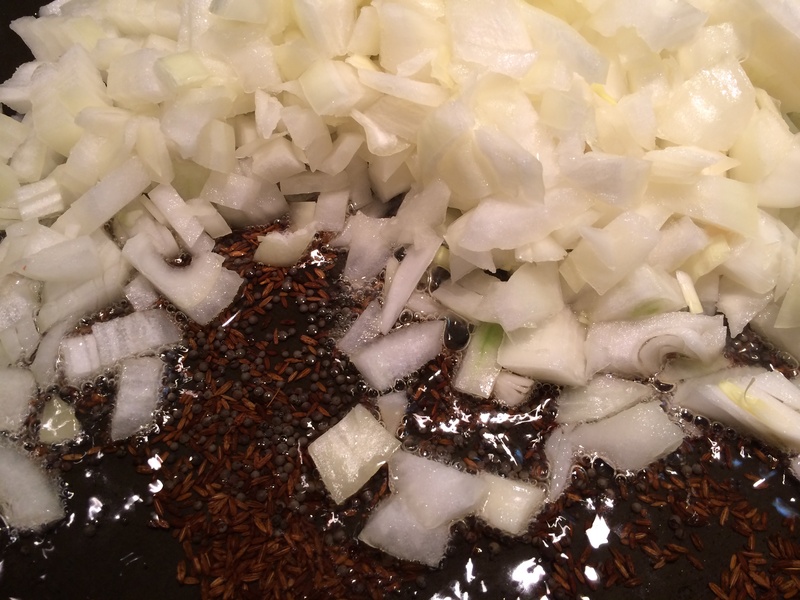 I like to serve it over basmati rice pilaf with toasted cumin seeds, but it goes well with any rice or with chapati or naan. 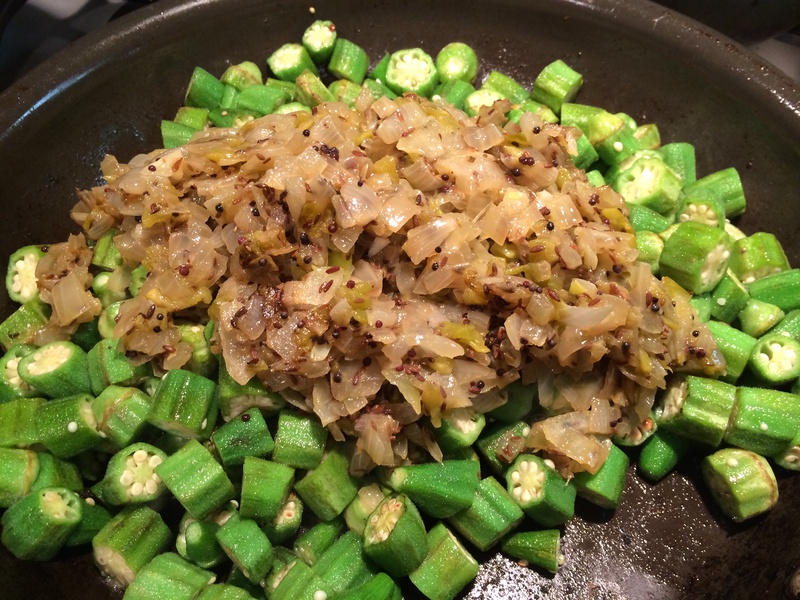 It is easy to overcook okra and make it too mushy. But it isn’t hard to avoid this. The trick is to pan-fry it in oil on its own for a couple of minutes until it turns bright green and starts to smell deliciously fragrant. 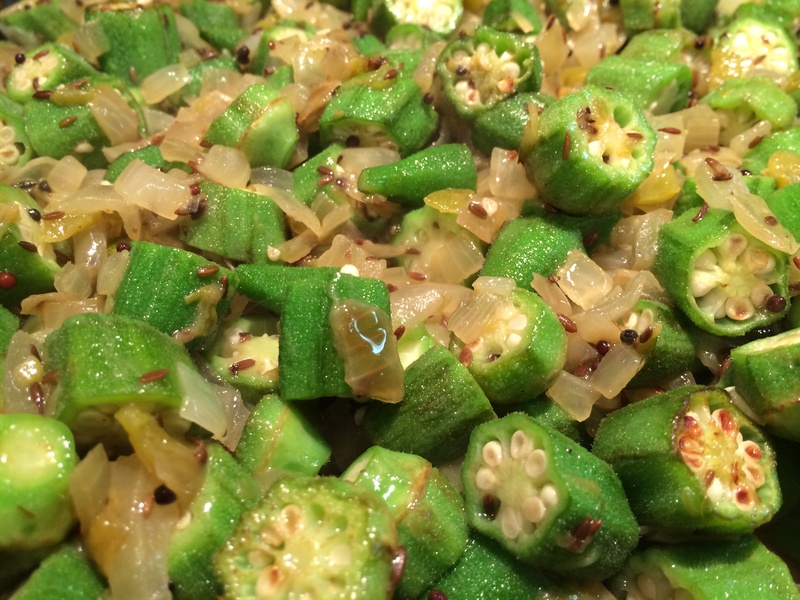 This brings out the flavor and helps the okra maintain it’s shape and delightful texture. After that, you can add anything else you want to it without it splitting. 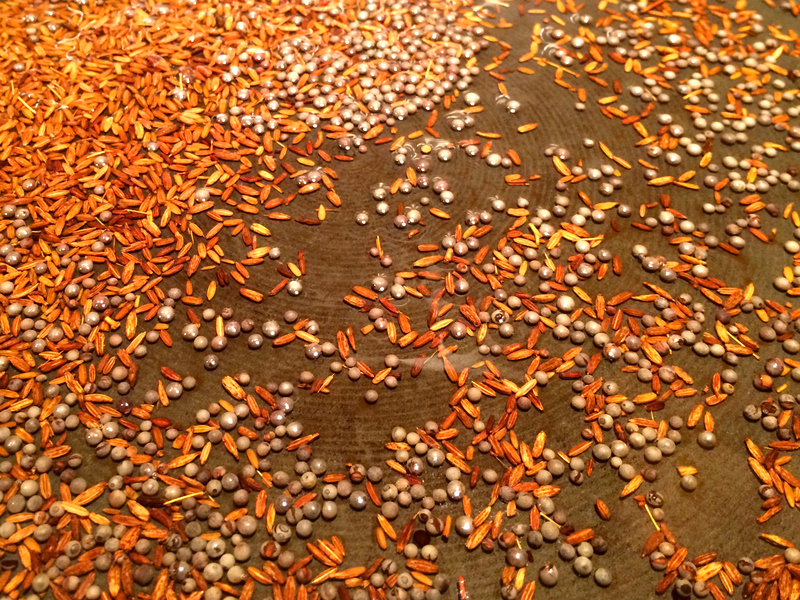 The version I make is fairly mild so my four-year-old (and my in-laws, who don’t like spicy food) can enjoy it too. I use canned green chills in place of fresh ones because they are much less spicy but still add plenty of green chili flavor to the masala. If you prefer to make it spicier, use 2-3 fresh green chilis in place of the canned ones. 7. 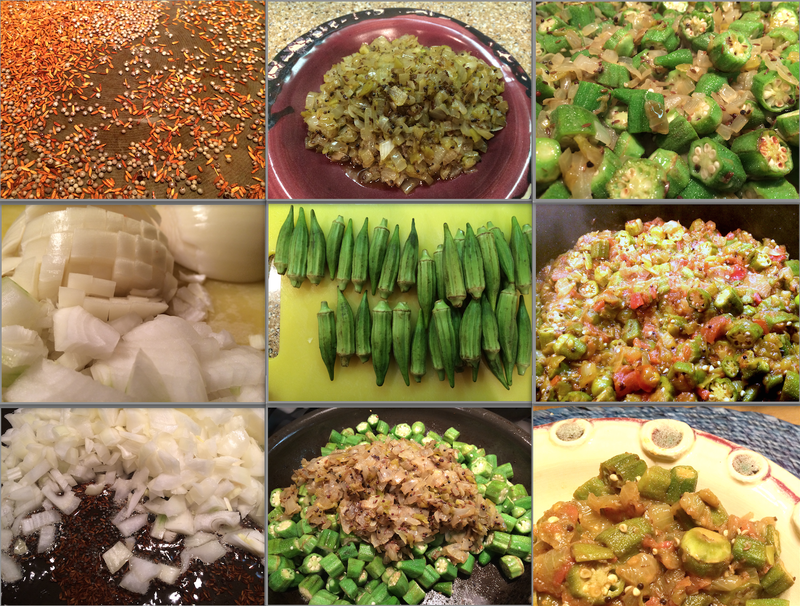 Add the onion and chili mixture to the okra, combine well, and cook for another minute on medium heat. 8. Add the coriander, chili powder, and turmeric, mix well, and cook for 5 more minutes. Then add the chopped tomatoes, mix well, cover the pan, and cook another 6-8 minutes (until the tomatoes are softened and the flavors have blended). 9. Uncover, add salt, and mix well, then cook for another couple of minutes on medium heat. Serve hot or warm. 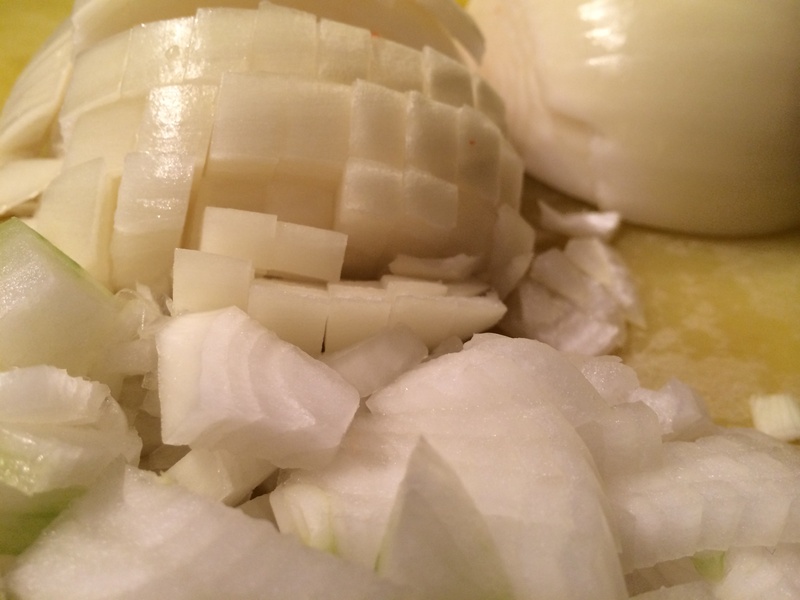 This preparation also works well as a side dish. I find it goes well alongside any type of meat or starch, and it makes a nice potluck contribution. It holds up well in the fridge, so if you want to make enough to eat for a few days you can. I always do, because whenever I make this everybody always wants to have it again right away! I was surprised to find it at the grocery store last week in Chicago, so maybe there’s a chance? 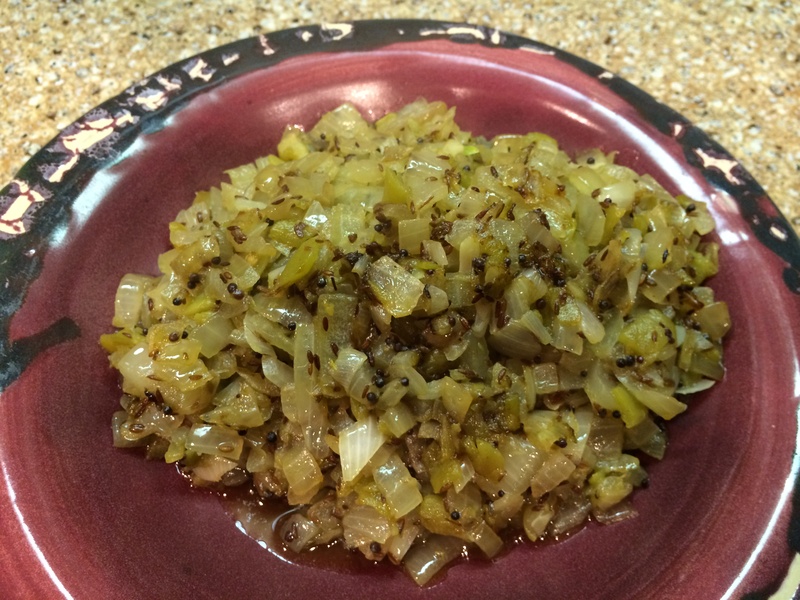 It’s a surprisingly warming dish, great in the winter if you can find the fixings. Thanks for stopping by. 🙂 Hope you’re holding up okay in all that snow! This sounds delightful, but I don’t think I can find fresh okra here. 😦 I may have to find a substitute! I’m trying to think of what you might substitute. Maybe green beans or eggplant? Are you in Mexico? Yes, I thought of eggplant. Also, the local squash here might work as well. I am looking new ways to spice up Okra. This sounds delicious. I’m going to try it! I hope you do! It is incredibly delicious.